Imagine the state of it: the United States executive mansion after 150 years of continuous occupation. 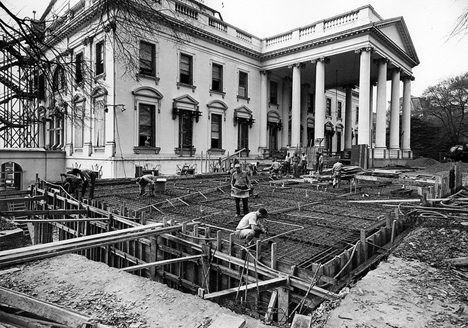 By this time, the already-aging White House had been retrofit with a maze of modern amenities like plumbing, electricity and heating – none of which this expansive estate was constructed to house. 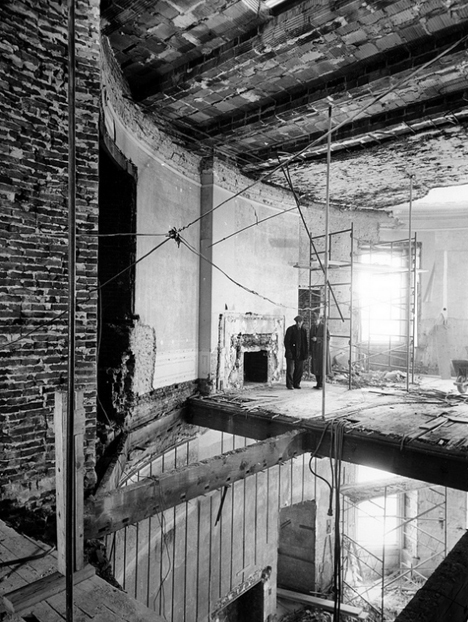 Per reporter Brian Resnick, sagging ceilings, scaffolding and supports had rendered the structure an unsanitary fire hazard by the late 1940s – some suggested scrapping it entirely and starting from scratch, but President Truman lobbied to keep and rehabilitate it. As these amazing photographs from the National Archives & Truman Library illustrate, the entire interior had to be ripped out. 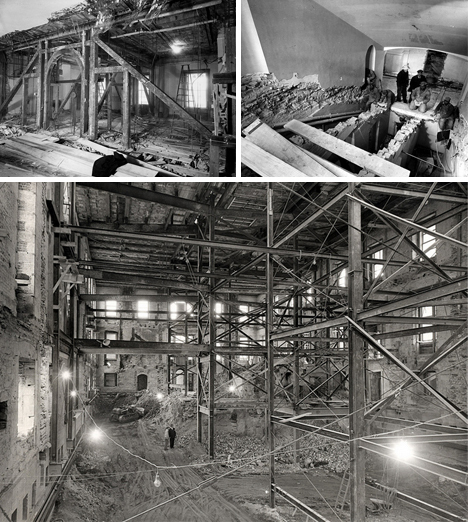 Historically valuable materials and decor were meticulously cataloged and stored, and temporary steel columns and beams erected to keep the exterior from collapsing. 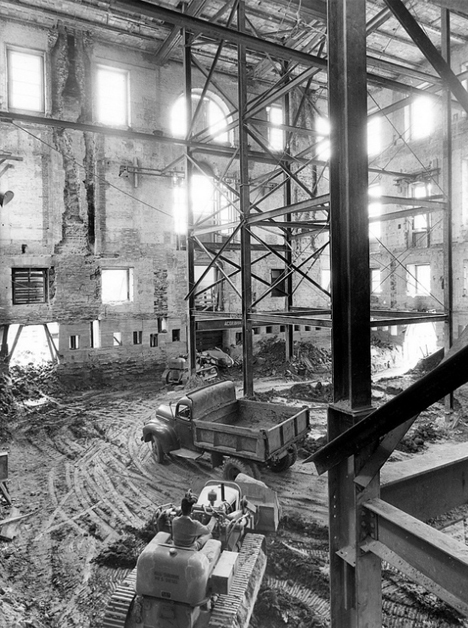 To get equipment like bulldozers inside and clear debris required disassembling machines to avoid bursting holes in the sides of the structure – rebuilding would have been cheaper and faster, but this careful treatment preserved irreplaceable pieces of US history. 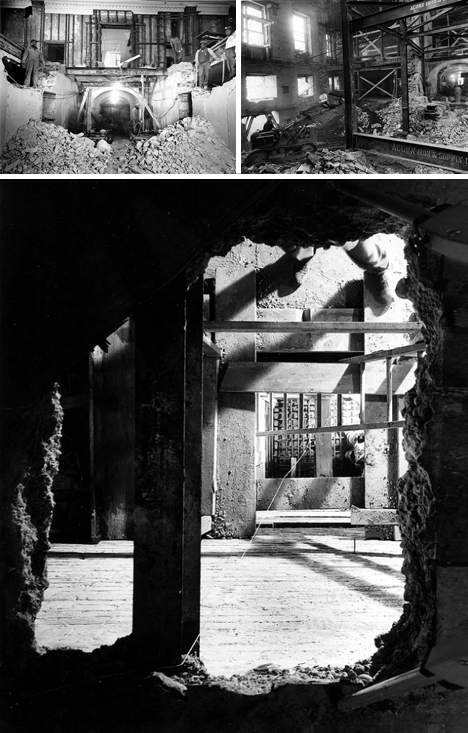 In all rooms and on all levels, lathe, plaster, brick and mortar were laid bare, giving a unique one-time view – fortunately captured in photographs – into the hidden structure and secret architecture of the most important residence in America.